The A102 VCF9 (a diode low-pass filter). The A103 VCF6 (an 18dB-per-octave low-pass filter). The A105 VCF (an SSM 24dB-per-octave low-pass filter). The A108 VCF8 (a 48dB-per-octave low-pass filter). The A109 voltage-controlled signal processor (VCF, VCA, voltage-controlled pan). The A124 VCF5 ('Wasp' filter). The A135 Quad voltage-controlled mixer. The A190 MIDI-CV converter/sync interface. The A198 ribbon controller/CV module. As you can see from this list, Doepfer now produce quite a few variations on the concept of an analogue VCF module, and it's here that I'll start my guided tour. The fascia of the A102 uses a standard Doepfer VCF layout with an audio input and output, controls for audio level, cutoff frequency, resonance and one fixed and two variable frequency-modulation CV inputs. The circuitry is based on an old analogue low-pass filter design utilising an arrangement of diodes as an element of the filter control stage, as opposed to transistors or chips. This 18dB-per-octave design is supposed to impart a particular character to the filter, and I'd certainly agree — I thought it was an unusual but not unpleasant sound. Fully open, the filter exhibits plenty of top end, which can sound a little buzzy when using raw square or sawtooth waveforms. The bottom end isn't nearly as interesting until the resonance is turned up, when some unusual interactions come into play. And adding more resonance introduces an increasingly unstable quality to the sound. At maximum resonance, the filter sounds like it is being overdriven, but with a superimposed undulating whistling effect. When it is self-oscillating (and without an input signal) it produces an ordinary sine-wave output. I'm quite a fan of Doepfer modules, and I'm often impressed by their build quality, but I hope the flightcase these modules arrived is just a blip in their usual professional approach. It's pretty poorly designed, badly fitting and to cap it all, the inside of the removable lids are covered in a deep-purple 'fun fur' fabric. Imagine a 1970s funk bordello... yes, it's that bad! And the shiny 'leatherette' outer finish won't last five minutes in an aircraft hold, a baggage carousel or in the back of a transit. If you need to flightcase your beloved Doepfer rack, my advice would be to invest in a professional road rack case, preferably a 'shockmount' type. Expensive? Well, yes — but so is a new rack full of Doepfer modules. This is another 18dB-per-octave low-pass filter with an almost identical feature set and layout to the A102, but using the more traditional so-called 'transistor ladder' (or Moog ladder) circuit design. The range of this filter is narrower than that of the A102 and the top end isn't nearly as cheeky. Also, the bass has a tendency to tail off just when you need a bit more 'oomph'. It comes to life a bit more when resonance is applied, but it lacks character. The filter will also self-oscillate, but it's nothing to get too excited about. Overall, this is really a much more restrained and smoother-sounding filter than the A102. This is a classic 24dB-per-octave low-pass filter design incorporating the SSM2044 chip, as used in the Korg Polysix and Mono/Poly, Fairlight II, PPG Wave, Emu SP1200 and other such illustrious instruments. Quite a heritage. The A105 differs from the two previous modules by substituting the third frequency CV input for a resonance CV input. Otherwise, the controls are basically the same. This is a very nice-sounding filter. In the upper registers, it is brighter than the A103 or A102, and although it lacks some of the 'bite' of the A102, this can be improved by adding a little resonance. The bottom end is nicely rounded, with or without resonance, and powerful synth bass sounds can be produced using the right waveforms. Unfortunately, the audio output does fall off quite a bit as resonance is introduced, and although the level control can sometimes compensate for this, it has to be used with care to avoid distortion. When self-oscillating, it produces a clean and wide-ranging sine wave. This filter has a distinctly more 'musical' character than either the A103 or A102. This module is intended to emulate the filter of an EDP Wasp synthesizer (see the Retrozone feature in SOS February 1995). To this end, it is a 12dB-per-octave multi-mode VCF based on the unusual 1970s design that lay at the heart of the Wasp filter. The layout and features are similar to the other Doepfer VCF modules, and although there are only two frequency CV inputs, this module includes an additional band-pass audio output and a low-pass/high-pass Mix control for the main audio output. This is a departure from the the original Wasp design, which included a three-way switch for selecting which of the three filter modes was active. By setting the Mix control to a 50/50 position (thus creating a notch or band-reject topology) and sweeping the frequency, you get a subtle but pleasing phasing effect, something the original Wasp filter wasn't capable of. If you haven't heard a Wasp filter before, I suppose you could describe it as having a rasping, thinner quality compared to other VCFs; the band-pass and high-pass modes are particularly nasal-sounding. The Doepfer A124 version sounds very faithful to the original, including the fact that it won't self-oscillate (due to a built-in limiter). In some respects it sounds similar to the A102 module; it even adds a similar sense of instability to the sound when it's resonating. However, one feature I've always admired in the Wasp VCF is the relatively constant audio output level it maintains, regardless of the frequency and resonance settings. This is something many other filter designs aren't able to achieve, but this module can. With a handful of modules, it is quite easy to put together a patch based around the A124 VCF that resembles the sound of an EDP Wasp in about 10 minutes. Actually, it would be a good idea if basic instructions on how to do this were in the manual or on the company web site (are you listening, Doepfer?) To recreate the full Wasp experience, it would be great to have a flat, touch-sensitive keyboard, although, as we'll see later in this piece, this can be emulated using the A198 ribbon controller. But owners of dead Wasps (there are many of us...) and Doepfer users looking to revisit the past should definitely invest in this module. The A108 is housed in a wider module, and includes similar controls and layout to the other VCFs already covered. It also has three Frequency CV modulation inputs. This filter is an eight-stage, 48dB-per-octave low-pass type featuring the 'transistor ladder' circuit design mentioned above, the so-called Moog ladder design. The main difference with this filter is that it includes five different filter slopes, all available simultaneously on independent outputs: 48dB-per-octave low-pass, 24dB-per-octave low-pass, 12dB-per-octave low-pass, 6dB-per-octave low-pass and band-pass types. Unusually, these outputs can also be internally reconfigured (using jumper links) to produce 42dB-per-octave, 36dB-per-octave and 18dB-per-octave low-pass filter slopes. There's also an additional 'external feedback return' socket that allows the insertion of other modules into the resonance feedback path. By way of example, you could use this to insert a VCA to give you voltage-controlled resonance. Although it doesn't have a singular 'character' like the Wasp or Diode VCFs, the A108 is capable of taking on the guise of many types of filter. This is undoubtedly one of Doepfer's most versatile VCF modules; unfortunately, but unsurprisingly, it is also the most expensive! Although these modules are available separately, the A144 is considered an extension to the A135, and is primarily intended to work in conjunction with it. The A135 Quad mixer is in essence four linear VCAs whose outputs are mixed down to a single audio output. It has a relatively basic set of controls mounted in a fairly wide module. The mono audio output is fed by four identical mono channels, and each has an audio input, an input attenuation knob, a gain control, an external CV input knob and a CV modulation input socket. As you'd expect, the sound quality is fine, with no coloration or strange audio artifacts. The module is ideally suited to patches that require some kind of mono mixing, for example combining simultaneous VCO waveform outputs, mixing multiple VCOs into a single VCF, combining VCF multi-mode outputs, and so on. However, even more interesting applications become apparent when you partner it with the A144 Morph controller. Although the name of this module might suggest Terminator-style abilities, what it actually does is quite simple; it transforms a single incoming control voltage (0V to +5V) into four separate, displaced control voltage outputs. In practical terms, this means that each CV output is progressively further offset from the original CV signal. Controls are kept to a bare minimum with just a CV input, an input attenuator, four CV outputs and a manual Morph control. If this doesn't sound as though it involves much in the way of morphing, that's where the Quad mixer module comes in. 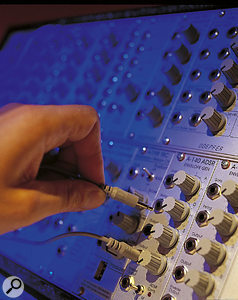 The first stage is to connect the Morph controller's four CV outputs to the Quad mixer's four CV inputs. This gives you the ability to crossfade (or morph) either manually or cyclically (using an LFO) from one mixer channel to the next using a single CV source. The next stage is to input four separate sounds into the Quad mixer. The final stage is to apply a CV source to the Morph controller's CV input, such as an LFO sine wave, keyboard pitch CV, analogue sequencer CV output or an ADSR output. The so-called morphing effect is what you'll hear coming from the Quad mixer's audio output, a continuous, cyclic and progressive crossfading of the four sound sources. The sounds can of course come from anywhere at all, but by way of suggestion, you might get good 'morphing' results from the output of four VCO waveforms, four different VCF outputs, four different effects patches fed by the same source, or four completely different patch setups (if you have enough modules!). On a slightly different tack, Doepfer's documentation also includes a useful patch for configuring the Morph controller as a automatic quadrophonic surround panner by using it to control four VCA modules from an LFO. Used with the right sounds, the A135 and A144 modules form an effective and open-ended combination. There's hours of rewarding fun to be had here for the experimentally minded. This versatile multi-purpose module contains separate VCF, VCA and voltage-controlled pan sections. Because this module is designed around the now-defunct Curtis CEM3379 multi-purpose chip (previously used in many Sequential, Ensoniq and PPG synths) there will only be a limited quantity of A109s available, which is a shame. However, it is certainly feature-rich and well specified for the price. Photo: Mark EwingThe filter section is a 24dB-per-octave, four-pole, low-pass design which includes two CV frequency modulation inputs and two resonance CV inputs. The filter also features a 'constant amplitude versus resonance design', which means the output level will remain relatively constant even when resonance is increased. It has two audio inputs (one variable) and a single audio output. The VCA has an audio input, two CV inputs (one variable) and a manual amplitude knob. The amplifier design uses a combined exponential/linear CV scale and a 'rounded-knee' response. This apparently allows a more natural envelope decay to zero when used with an ADSR generator. The voltage-controlled panning section includes a single audio input, two audio outputs (left and right), two voltage control inputs (one is variable) and a manual pan control. This part of the module is actually two complementary VCAs, which also use a combination of exponential and linear CV scales, depending on the voltage applied. All three sections are hard-wired internally (VCF to VCA to voltage-controlled pan) so no patching is necessary, other than connecting a source signal (VCO) to the VCF and the left and right outputs to a mixer or amp. However, all the audio connections are normalised, so you can easily tap into or out of the internal audio path. 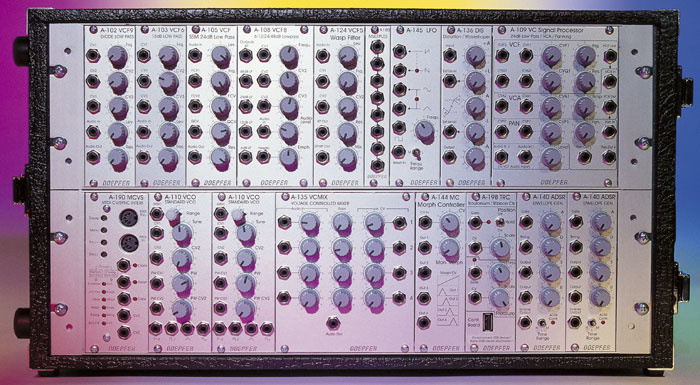 This is an ideal module for anyone starting out, on a budget, or tight for space in their A100 rack, as all you need to get it up and running are a VCO and an ADSR generator. The quality of the filter is very good, with a sound and character reminiscent of the A105 VCF module. I've no complaints with the VCA either, which is transparent and yet punchy when used with short ADSR settings. The voltage-controlled panning feature is a bonus too, and adds a lot to the module's appeal. The A136 is a voltage-controlled distortion module, designed for complex waveform manipulations and distortions. The A136 works its wonders by taking an incoming audio or CV signal and dividing it into three component parts: positive, original and negative. These components can then be controlled by external CV modulations using two CV inputs, or can be manually adjusted using five control knobs (+A, +L, A, -L, -A). The scope of distortion/modification stretches from basic soft clipping to extreme warping that renders the original tone unrecognisable. It is hard to accurately describe the effect produced by this module, because the same settings can sound completely different depending on the source material. Feed the A136 a square wave and it is possible to get a decent pulse-width modulation effect. However, inputting a sine or triangle wave using the same settings produces a buzzy, 'squeezed' kind of sound that has a tendency to disappear completely if modulated too much. Sometimes, the A136 produces sounds similar to digital 'bit-crushing', although more analogue-sounding. It definitely produces the most interesting results with complex material, filtered waveforms, drum machine outputs and so on. If there is one problem with this module, it's that the controls don't always act as you would expect, and some settings will produce absolutely no output at all with certain signals. Perseverance will pay off, though — just don't expect instant results. Even though this MIDI-CV module is fairly narrow, it crams in a surprising number of features, including two independent DACs (digital-to-analogue converters), MIDI In and Thru, five analogue outputs and direct system buss connection for the CV and Gate signals to the Doepfer rack without using additional connections. There is no LED display, and editing is carried out by way of four (very) small buttons and six red LEDs. I couldn't really describe programming and editing the A190 as intuitive. You'll need the instruction manual handy at first, but once you've tried it a few times, it doesn't seem such a big deal, and anyway, the default MIDI-CV conversion settings will be fine for most users. DAC1 has a 12-bit resolution and only converts MIDI note messages to pitch control voltages. Its output is hard-wired to the CV1 output and it is intended for precise 1V-per-octave VCO pitch control. DAC2 is wired to the CV2 output and although it only has a seven-bit resolution, it can be assigned to handle various types of MIDI message (for example pitch-bend, aftertouch, velocity, and so on). The CV2 output is suitable for non-critical modulations of VCFs and VCAs and the like. The A190 also features separate Gate, Clock and Reset outputs. Gate signals are automatically generated when a MIDI keyboard message is received, and there are options for setting the gate to positive or negative polarities and single or multiple triggering. The Clock output is derived from the incoming MIDI clock speed and the output pulses can be set to generate positive or negative types. The clock divisions are programmable over a range of 4ppqn to 96ppqn (Roland drum machines and TB303s sync to 24ppqn, so there are no problems there). 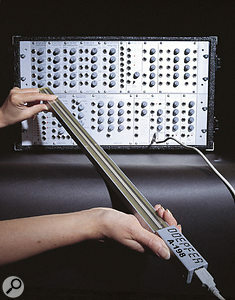 A Reset output is generated when MIDI start/stop/continue commands are received and this is intended to control the transport functions of Doepfer sequencer modules. Also included is a basic MIDI-controllable LFO, with variable depth and frequency (0.2Hz-20Hz) and programmable portamento (glide). The A190 is surprisingly versatile for such a compact module, and apart from the fiddly editing, I can find little to complain about. It's stable and was happy to track accurately across a five-octave MIDI keyboard. I've saved the most interesting of the new Doepfer modules for last. The A198 comes in two parts: a ribbon controller (the part you rub your finger across) and a CV module. This pair also form part of the Trautonium range, an on-going project using specially designed Doepfer modules to emulate various aspects of the Mixtur Trautonium electronic instrument, an invention of Friedrich Trautwein's in the 1930s. The Trautonium project is hugely interesting, but space precludes me from explaining it here. Fortunately, Doepfer's web site contains an extensive page with all the details of the project (check out www.doepfer.de/traut/traut_e.htm). The A198 ribbon controller not only notes the position of your finger, it's pressure-sensitive as well, making it a versatile and expressive tool.Photo: Mark EwingMost of the major electronic instrument manufacturers have produced ribbon controllers of some kind, including Moog, Korg, Yamaha and Kurzweil. They have been in use for a long time, and the sound they are most usually associated with is a pitch-sweeping, Theremin-like effect. 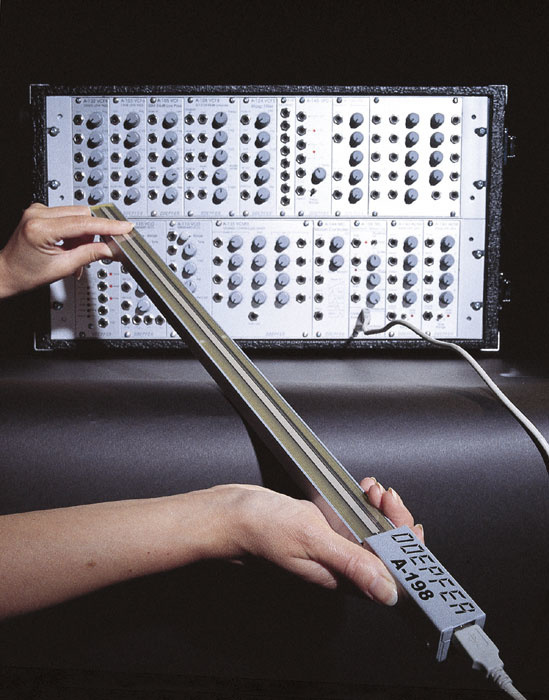 Doepfer's spin on ribbon controlling comes in the form of a 50cm plastic-coated, pressure-sensitive, linear potentiometer, which is set into a sturdy steel frame (60cm x 20cm x 10cm). The controller is then connected via a cable to the A198 module. The module contains two position-sensitive control outputs (Gate and CV), a position Scale/Spead control and a Position Hold switch. There are also two pressure-sensitive control outputs (Gate and CV), a pressure Scale/Spead control and a pressure Threshold control. Both the Gate outputs include LEDs for visual feedback while playing. All you need to start producing sounds with the ribbon controller is a finger and a single VCO, but you won't get the best out of it unless you're a little more adventurous with your patching. The instruction manual includes some useful example patches, and there are a few MP3 demo files on the Doepfer web site too. A typical patch would include a VCO whose pitch is controlled by the Position CV output, a VCF controlled by the Pressure CV output and a VCA under control of an ADSR, which is triggered by either of the Gate outputs. Depending on your style of playing you need to adjust the Position Scale control to give the correct pitch spread across the ribbon. For extreme pitch-bending and warping (from very low to very high and vice versa) the Scale would be set to a wide spread. For more accurate playing techniques Doepfer recommend adjusting the VCO Pitch and Scale control to produce a spread of approximately one octave over 25cm (half the length of the ribbon). If set up in this way it is possible, with some practice, to play pretty decent melodies, even if they do sound like they are played on a 21st Century musical saw! Also, some very expressive vibrato effects can be achieved in this mode by gently wobbling your finger from side to side, a little like playing a violin. For more accurate pitching, Doepfer recommend using their A156 Quantiser module, which will chromatically smooth out any pitch instability, producing more of an arpeggio effect. However, I think this rather defeats the point of the ribbon controller's major feature — highly controllable, unquantised CV output. Anyway, couple these pitching techniques with its pressure abilities, and the ribbon controller literally becomes an instrument that can be learnt and played, something along the lines of a single-stringed fretless bass. When the Pressure Gate output is patched to a VCA/ADSR combination, you can also use the controller to simulate a EDP Wasp keyboard, by jabbing and poking your fingers at the ribbon rather than rubbing them across it. Some great trilling effects can also be achieved if you try this with your fingers at opposite ends of the strip. There are endless applications for the ribbon controller: filter sweeps, volume swells, morph controlling (using the A135/A144 combo), theremin impersonations, and so on. Although I had great fun with the A198 controller, there were a few points I wasn't entirely happy with. If the Position Hold switch is set to Off, the CV pitch drops to zero when your finger is released from the ribbon. This is perfectly normal. However, if the Hold switch is set to On, the CV pitch is meant to be sustained by a sample-and-hold circuit and the Gate signal held on. What actually happens is that after a few seconds the CV pitch starts to drift downwards noticeably. This is not something I would expect using state-of-the-art analogue technology, and I hope that it is just a quirk of the review unit. The same could be true with another problem I found; the pressure sensitivity just wasn't sensitive enough! I had to press down really hard to get a decent response, and although this problem did seem to get a little better the more I used it, maybe I was just subconsciously pressing harder. My last point is purely a question of taste. The controller's umbilical cable is connected to the right-hand side of the ribbon controller. OK, so this may not seem like a big deal, but if you 'strike a pose' with it, as you would with a guitar, the pitch response is upside-down, and running a finger 'up' the ribbon produces a 'downward' pitch sweep. Of course, this could be corrected by patching in an A175 Voltage Inverter to the CV output, but it would be nice if the module included some kind of pitch-inversion option instead. Doepfer still surprise me with their inventiveness and innovation. They are constantly coming up with ever smarter ways of manipulating CV and audio. And I can tell you (from experience) that getting into modular synthesis is habit-forming. To be perfectly honest, if I had the space (and the funds) I would probably buy all of these modules, and if you're interested enough in modular synths to have read this far, I'm guessing the same applies to you! What's more, there's another reason to throw caution to the wind, and to buy now, worry about the overdraft later — these modules won't be around for ever. 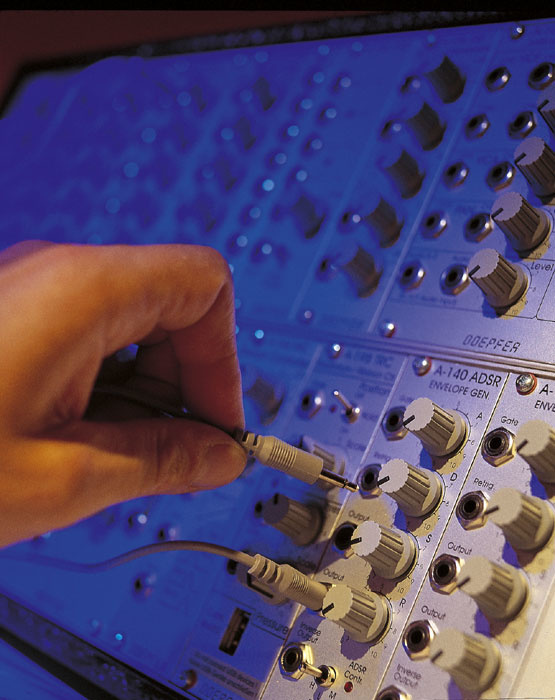 It seems to be a current trend for manufacturers to produce hardware modules which emulate features of particular classic analogue synths and effects units using original circuit designs and components. Bob Moog (with his Moogerfoogers), Analogue Systems and Doepfer have all taken this route in recent years. This is great, but as many designs rely on an ever-decreasing supply of specific analogue components, when the source of those parts eventually (and inevitably) dries up, the only alternative will be emulation using DSP technology or producing software versions — and neither of these is a solution for analogue purists. Some of the modules reviewed here rely on such components and, as the saying goes, 'when they're gone, they're gone'. This is a shame, as these are some of the best modules I've reviewed in years. If you're at all interested in them, my advice would therefore be to buy them now, before it's too late. Or, to be more accurate, before they're only available on the collectors' market for 10 times the price! A102 VCF9 (diode low-pass filter): £65. A103 VCF6 (18dB low-pass filter): £65. A105 VCF ('SSM' 24dB-per-octave low-pass filter): £79. A108 VCF8 (48dB-per-octave low-pass filter): £119. A109 voltage-controlled signal processor (VCF, VCA): £99. A124 VCF5 ('Wasp' filter): £49. A135 Quad voltage-controlled mixer: £79. A excellent range of fine-sounding VCFs. The ribbon controller is both expressive and fun to use. The MIDI-CV module features an impressive number of features for something so small. The Morph controller/Quad mixer combo allows for some unique effects. The A100 is an open-ended system, full of potential. The modules are sensibly priced. The pressure-sensitive ribbon controller reviewed requires a great deal of pressure! The ribbon controller module suffers noticeable frequency drift. Adjusting some modules doesn't always give predictable results. Buying modules can be habit-forming! Doepfer deliver the goods yet again with an excellent selection of great-sounding filters and innovative module designs. The interactive ribbon controller is expressive and fun to use, particularly when in combination with the Morph controller. See the 'Module Pricing' box.